The practice of packing a bag is a situation where subtle, daily processes can attune us to the relationships and experiences formed in mobile situations. There has been great attention to mundane and material practices in tourism, yet the process of packing, which is integral to any journey, remains unexamined. 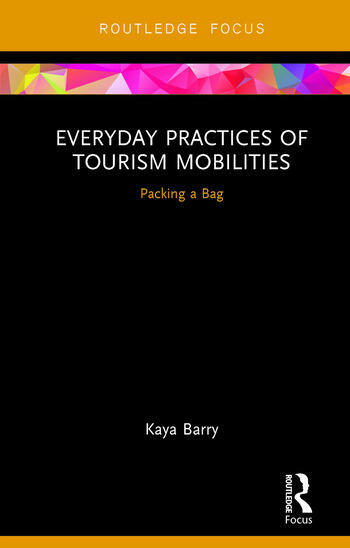 Everyday Practices of Tourism Mobilities: Packing a Bag expands on the foundational theories of tourist practices through a rich assortment of photographic documentation and interviews with tourists in hostelling accommodation. It presents the intricacies and relations emerging through packing and the connections to an array of actors entwined in both touristic and everyday experiences of movement. Using case studies in Iceland and Nepal, the book explores how idealised tourist destinations influence everyday actions. The disjuncture between mundane routines and the heightened immersive environments is conducive to tourists attuning to the entanglement of actors and experiences beyond individual expectations. The book traces these moments of collective experiences to reflect on the intersections of globalised mobility and everyday tourist practices. The international scope of this highly original and intriguing book will appeal to a broad academic audience, including scholars of tourism, cultural and social geography, mobilities studies, and environmental humanities. Kaya Barry is an Associate Lecturer at the School of Humanities, Languages, and Social Science, and member of the Griffith Centre for Social and Cultural Research at Griffith University, Australia. Her research interests include mobilities, tourism, creative arts practice, materiality, communication aesthetics, and environmental humanities.